DALLAS – James Neal didn’t play in any preseason games for the Vegas Golden Knights as he recovered from off-season surgery to repair a broken hand following the Stanley Cup playoffs. It took him a little over two periods Friday night to shake the rust off. The 6-foot-2, 221-pound left winger scored the first goal in franchise history with 9:33 to go on a wrist shot that sailed through traffic to tie it at 1-1, then scored the first game-winning goal in team history with a sliding wrist shot from the right circle with 2:44 remaining to give the Golden Knights a dramatic 2-1 victory over the Dallas Stars at American Airlines Center. Goalie Marc-Andre Fleury was brilliant in net for Las Vegas, stopping 45 of 46 shots to keep the Golden Knights in the game until Neal warmed up. The first victory in franchise history came just five days after 58 people were shot and killed at a country music concert just a short walk from T-Mobile Arena. Golden Knight players said afterward they hoped the win might heal some of the pain the Las Vegas community has been experiencing. “(Sunday’s shooting was) something to rally around,” Neal added. “But for all of us it’s a new chance, a new start. When you’re part of an expansion draft they tend not to give you that much of an upside. But we have a good hockey team. We have some good players. We had a lot of fun tonight. We had a great training camp, and it showed. Dallas led 1-0 after two periods when Tyler Seguin redirected a shot by Devin Shore over Fleury’s left shoulder and into the top corner with 2:59 remaining. But Neal, who also delivered the hit of the night at the end of the period on Sequin in the goal crease, made history midway through the third period when he scored on a delayed penalty from the top of the right circle, wristing a shot through traffic that beat backup goalie Kari Lehtonen, who relieved starter Ben Bishop after he was injured earlier in the period. 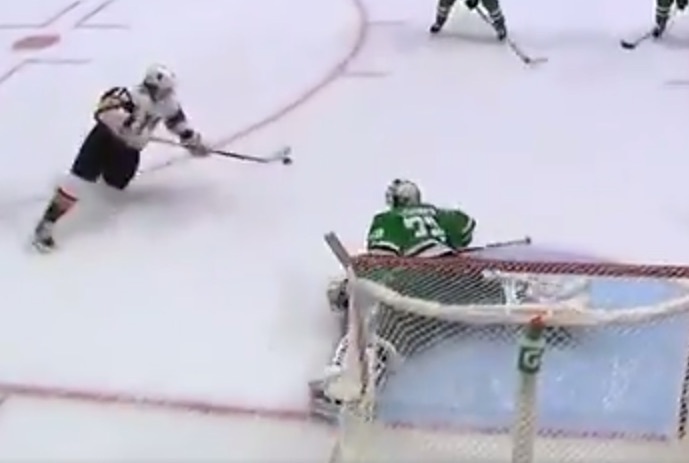 Less than seven minutes later, Neal, sliding on his knees after taking a pass from center Cody Eakin, lofted a shot over Lehtonen for the game-winner. The Golden Knights had little time to celebrate the victory. They flew to Phoenix immediately after the game where they will play the Arizona Coyotes on Saturday night at 6 p.m. PT at Gila River Arena.